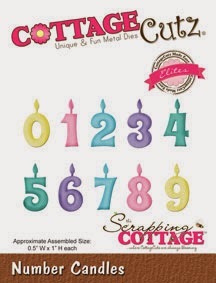 Today I wanted to share a Birthday Card I made for the Scrapping Cottage using the darling CottageCutz dies. For my CottageCutz Mr. Snuggles, he was cut with white card stock, and then colored with 4 different Copic's in E shades. Next I added some blush to his cheeks, and some white gel dots. For his eyes I used Viva Pearl Pen in black. His nose is popped up using a pop dot. 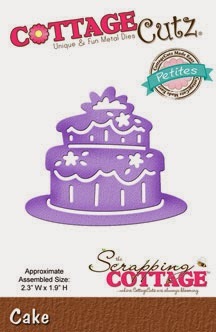 Design Paper- is from American Crafts and is the Pebbles Birthday Wishes paper stack. Love the designs on this dp, perfect for the CottageCutz Birthday Release. 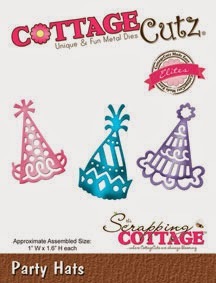 CottageCutz Party Hat is cut using the same design paper. I also used another design from this same paper stack for the cake. Layers- on this card there are 4 layers, that includes the doily on the background layer. 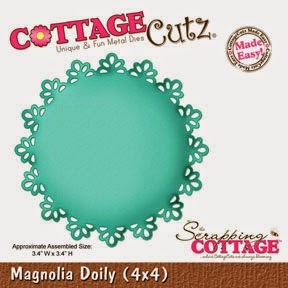 I used the CottageCutz Magnolia Doily for the top circle layer. This is for my main images. Embellishments- I used some brads that I had picked up at the AC warehouse sale last year. I ended up using the Yellow and Blue ones. I also used a Viva Pearl Pen in white to do all the Pearls on the cake and hat. Next I did use glitter glue on the hat as well. Ribbon is extra that I picked up for an awesome deal at the same warehouse sale. 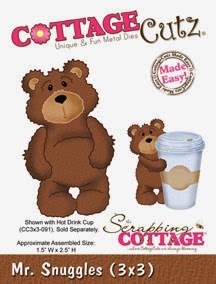 CottageCutz Dies Used: these photo's are all linked to the Scrapping Cottage Store for easy finding. Here is real party going on. Great card and die cust combination. A sweet bear....my favorite. Love this darling creation. It just speaks to me.